Burtanna is one of those very old and wise souls. 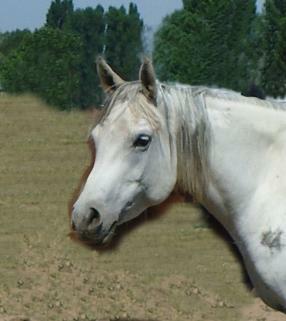 She is an easy going mare and is a great one to have watch over the young stock. We acquired her late in her life, but she still has a good many years ahead of her to raise foals and to be trained to do some riding. Burtanna is put together very nicely and has a lot to offer for our stallions. 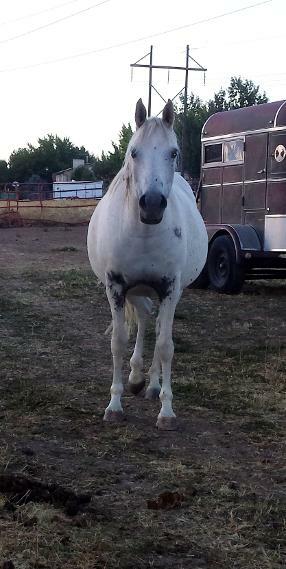 We love her shoulder and her long legs, along with her big solid hooves, big body, and classic head. When crossed on our stallions, I think Burtanna will have some beautiful athletes to contribute to the breed. To date, Burtanna's foals have all had her outstanding temperament. Burtanna is bringing in some blood to our herd that we haven't had before and we are really excited to add her influence into our group. We can't wait to be able to utilize her *Nariadni, Arax, Aswan, and others into our athletes. 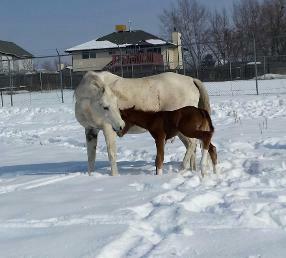 Her Quarter Horse filly is an amazing child's mount, wonderful brains and temperament. 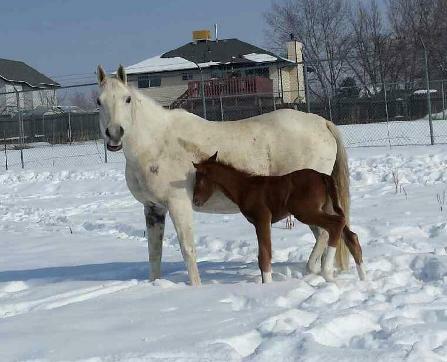 Burtanna's Arabian colt has great Arabian type, is a fantastic athlete with a willing, loving attitude, wonderful and laid back when working cattle, and has amazing gates moving out comfortably. 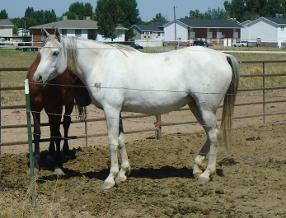 Burtanna's Quarter Horse colt has great bone, fabulous attitude, and is going to make a fantastic Ranch horse. Her Arabian filly is absolutely gorgeous, possessing her dam's amazing mind and presence. Burtanna's pedigree boasts some of the who's who of the Russian breeding empire, along with some of the old time greats of Egypt. Some of the names you might recognize on her papers are: *Nariadni, *Muscat, *Naborr, Aswan, Arax, Mussiah+, Ansata Ibn Halima++, Fay-El-Dine, , Gai-Adventure, Ferzon, *Raffles, Nazeer and more. We look forward to utilizing her blood in our herd. With the right stallion, she will be one heck of a producer for us.